Improved report filtering, and organization features for the ERA-EMS have been rolled out this January as part of the many planned updates for 2013. These new features will make it significantly easier to find specific reports from the large built-in reporting library, search through your own custom reports, and manage how those reports display the information you use most. A report code filter option has been added to the reporting menu that enables you to view only reports containing the character(s) entered into the Report Code field. A sample display of a user filtering the reports library to display only reports with 250 in the report code. A filtering option has also been added to the Reports Viewer menu that allows you to filter all reports queued in the viewer to display only those reports with codes containing the characters entered into the Report field. A sample display of how to use the new Report Viewer filter to display only the reports in containing certain characters or numbers. ERA has also added an second method for organizing and reordering the columns within custom reports. In addition to being able to highlight a particular column and moving it up or down in the column order with the Up and Down buttons, you can now enter a number in the Column Order field to determine the order the columns will be displayed. 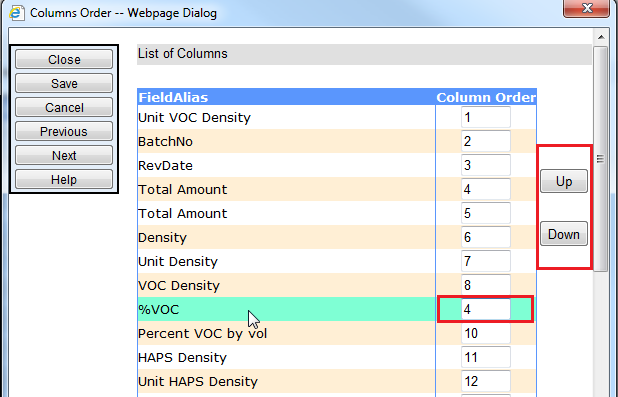 The highlighted column name (%VOC) can be moved either higher or lower in the display order using either the Up and Down buttons or by typing a number in the column order field. If you have any questions about these improvements please do not hesitate to contact your ERA support agent by calling us at (514) 684-6408 ext.105, or by email at: tech_support@era-ehs.com.